Eight sediment cores recovered from Tamaki Estuary were analysed for Cu, Pb, Zn, and Cd using downward cored sub-samples. The results indicate a significant upward enrichment in heavy metals with the highest concentrations found in the uppermost 0–10 cm layer. 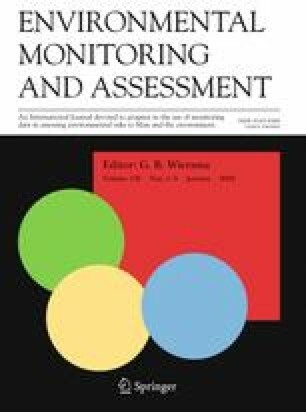 Assessment of heavy metal pollution in marine sediments requires knowledge of pre-anthropogenic metal concentrations to act as a reference against which measured values can be compared. Pristine values for the cored sediments were determined from flat “base-line” metal trends evident in lower core samples. Various methods for calculating metal enrichment and contamination factors are reviewed in detail and a modified and more robust version of the procedure for calculating the degree of contamination is proposed. The revised procedure allows the incorporation of a flexible range of pollutants, including various organic species, and the degree of contamination is expressed as an average ratio rather than an absolute summation number. Comparative data for normalized enrichment factors and the modified degree of contamination show that Tamaki Estuary sediments have suffered significant systematic heavy metal contamination following catchment urbanization. Compared to baseline values the uppermost sediment layers show four-fold enrichment averaged across eight cores and four analysed metals.